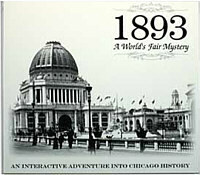 1893: A World's Fair Mystery (Peter Nepstad; 2002; TADS 2). XYZZY Awards 2002: Winner of Best Setting. Finalist for Best Game. Order the 1893 CD-ROM from Illuminated Lantern for $19.95 USD, plus $3.00 shipping via PayPal. Purchase a downloadable copy from Manifesto Games for $14.95 USD. This option became available on June 1, 2007. Breaking Boundaries in Gaming Demographics - Peter Nepstad's blog entry on buyer stats for 1893: A World's Fair Mystery. 1893: A World's Fair Mystery (archived) - at Baf's Guide. 1893: A World's Fair Mystery - at IFDB. 1893: A World's Fair Mystery - at Home of the Underdogs. 1893: A World's Fair Mystery - at IF Ratings. 1893: A World's Fair Mystery - at IFReviews.org. Reviews - (and collected quotes) at Illuminated Lantern. Review by Paul O'Brian - at IF-Review.